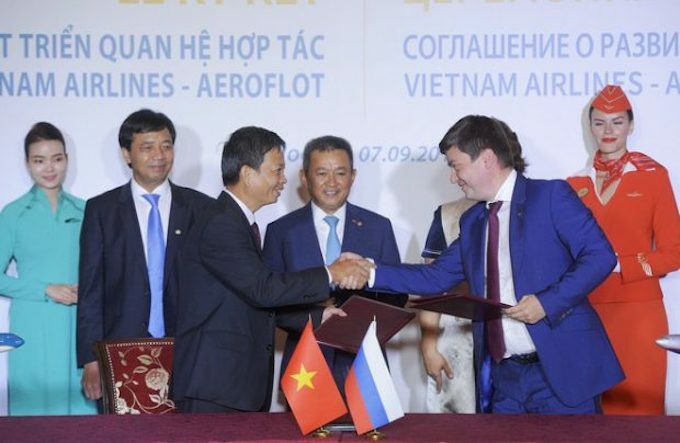 Vietnam Airlines and Aeroflot have signed a Memorandum of Understanding (MOU) to strengthen cooperation between the two airlines. According to the Memorandum, from 2019, the two airlines will begin codesharing on domestic routes in Vietnam and Russia and expand their cooperation across several areas of the business. The partnership is set to enhance the two airlines’ prosperity as well as deliver benefits to customers. The agreement also further expands travel opportunities between Russia and Vietnam, as well as increasing passenger volumes and economic and trade activities between the two countries. Trinh Ngoc Thanh, executive vice president of Vietnam Airlines, said: “The agreement marks the 25 anniversary of Vietnam Airlines’ first services to Russia. Vietnam Airlines offers three direct flights per week between Hanoi and Moscow, operated on Boeing 787-9 Dreamliner aircraft. Aeroflot operates nine flights per week on routes between Moscow and Vietnam with a daily flight to Hanoi and a twice-weekly service to Ho Chi Minh City.